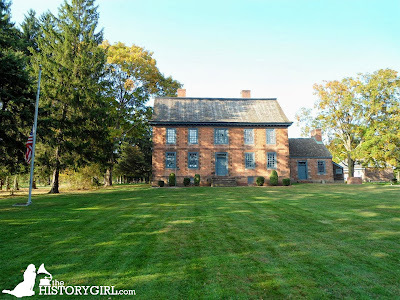 The Dey Mansion: Where Washington Rang Twice ~ The History Girl! Set back from the road and surrounded by the Preakness Valley Golf Course in Wayne, New Jersey is a lush green lawn that leads to the historic Dey Mansion. Once totaling 1,000 acres, the property has been reduced to a mere two around the core of the site, which includes a number of outbuildings and a formal garden. Twice a Revolutionary War headquarters for George Washington, this Georgian-style Dutch homestead retains a high value of craftsmanship and authenticity, proving that the builders could construct a home that would stand the test of time and survive well into the twenty-first century. The land on which the Dey Mansion was built was purchased on October 9, 1717 by Dirck Dey (b. 1687, d. May 8, 1764). Dirck was the third generation of his family to live in the colonies, settling in this area of New Jersey as early as 1707. Dirck served as a freeholder of Bergen County and as a member of the New Jersey Assembly between 1748 and 1752. It is believed that the main block of the home was constructed sometime between 1740 and 1750. The east wing of the home (right side) was built by Dirck, a carpenter by trade. The west wing (left side), including the center hall, was completed by Dirck's son, Colonel Theunis Dey, born October 29, 1726. 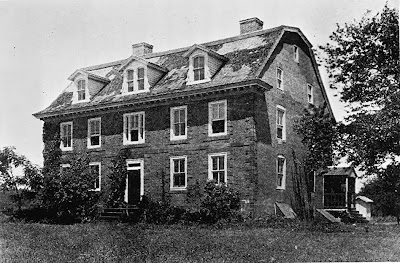 Family correspondence written by Hester Dey, Colonel Dey's daughter, refers to the property as "Bloomsburg Manor" while Dey refers to it as "Bloomsbury" in a letter to George Washington dated April 22, 1777, but neither name survived into the nineteenth century. The mansion is five bays wide with a central door and wide center hall. The center hall measures twelve feet across, a considerable size for that period. Each side of the hallway contains a double-pile room layout, typical of a Georgian style home. However, unlike other Georgian homes of this period, the central staircase is not located at the rear of the the center hall, but off to the western (left) side of the house, concealed from view by a wall. Consequently, the western side's rear room is considerably smaller to accommodate the staircase and is not a mirror image of the front room. Colonel Dey's bedroom at the Dey Mansion, Wayne, NJ. The front facade is composed of brick in a Flemish bond pattern with sandstone quoins from the Little Falls Quarry on the front corners of the house. The remaining three sides of the home is made from split quarry and field stone. On the sides of the home, the dressed stone rises to the top of the second floor. Above it is brick. Dressed stonework complements the front windows and doors on the front of the house. Similar stonework accentuates the first, second, and third floor lines. All of the brick used in the home's construction was burned on the property. The cedar-shake gambrel roof is composed of a low pitched upper section and a steep lower section with a slight flair at the eave. This area accommodates a full third floor and another attic space above it, with windows on the gable ends. Two square chimneys are situated in the middle of the gambrel and halfway along the central wall of the house. Each chimney contains four separate flues for eight interior fireplaces. General George Washington used the mansion as his headquarters in July 1780. He arrived at the home on July 1 from Morristown with approximately four thousand soldiers and placed them along the Passaic River and the Singac Brook that ran along the outer border of what was then a six hundred acre property. The home was a logical headquarters because it was in the Preakness Valley, surrounded by mountains which offered great protection, but close enough to the British in the Harlem area. Theunis Dey, who owned the home during the Revolution, lived there with his wife Hester Schuyler (married in 1749) and their ten children. Dey was a Colonel of the Bergen County Militia, a member of the New Jersey Assembly and the New Jersey Provincial Council, and served as a trustee of Queen's College (now Rutgers University). Thus, it would be no surprise that Dey's large house and sympathetic feelings toward the revolution would encourage Washington to stay in his home. Washington maintained his headquarters at the Dey Mansion until July 29. At least two letters, dated July 22, 1780 "To the President of Congress" and July 27, 1780 "To the Marquis de Lafayette" mention "Head Quarters, Pracaness [Preakness]". "Preakness" is another name for the area surrounding the Dey Mansion. Other letters from earlier in the month simply say "Bergen County", of which this section of present-day Wayne was once part of. The large center hall of this Georgian-style home, which served as a formal dining hall during Washington's stay. The army moved to Paramus at the end of July and from that time until early October, Washington campaigned in the Hudson Highlands. From October 8 through November 27, 1780, the General, his guards, and his aides took up residence at the home once again to avoid a chance meeting with Sir Henry Clinton, who desired to avenge the death of Major John Andre on October 2, 1780 by capturing Washington. During his stays, Washington used two rooms on each floor. His personal guards slept in the attic. His office was in the southeast room of the first floor and he used the room to the rear of it for dining, except for when the official family was with him. During these occasions, he would use the large center hall. Guests during Washington's stays included Marquis de Lafayette, General Anthony Wayne, Alexander Hamilton, General Nathaniel Greene, and Lord Stirling. Published stories as early as 1902 reveal that Washington paid to have all four rooms he occupied papered at his own expense and that it lasted until about 1870, but no physical evidence has been found to substantiate that claim. Dey Mansion, circa 1930 before restoration. Colonel Theunis Dey died on June 10, 1787 and the family property was inherited by his son Richard Dey. The mansion was sold out of the family by Richard in 1801. Between 1801 and 1930, the home changed ownership seventeen times. Owners included Passaic County Sheriff William Hogencamp (circa 1860) and lawyer William H. Belcher (1902) of Paterson, New Jersey. In 1930, the now defunct Passaic County Park Commission purchased Dey Mansion, along with several barns and fifty-five acres of land. The home, now empty, altered, and deteriorating due to a lack of constant maintenance, was in need of a major restoration. A plan to restore the structure was developed under the direction of Charles O. Cornelius, a former Associate Curator of the Metropolitan Museum of Art and a recognized authority on early American architecture. After four years, the restored building opened to the public on October 8, 1934. The restoration work included removing dormers on the gambrel roof which had been added at some point during the 1870s during a renovation and replacing the existing four-over-four windows installed during the 1870s to the original sixteen-over-sixteen lite sash configuration. The largest phase of the restoration was rebuilding the kitchen and lean-to that had been destroyed by fire. The remains of the original foundation were located and a new kitchen, complete with a cooking fireplace, was constructed in 1938. The mansion was added to the New Jersey and National Registers of Historic Places in 1970.